Manage your content writers with ease! 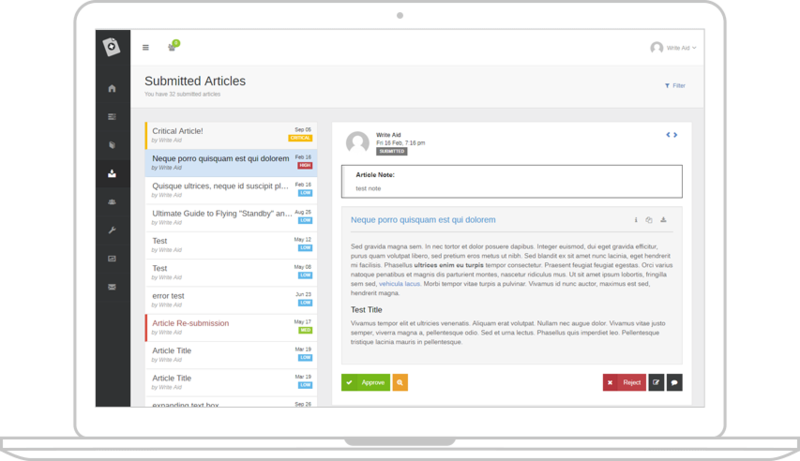 Efficient article content and writer management - without the headaches. You should be spending as little time as possible when you're outsourcing - that's the whole point in doing so. 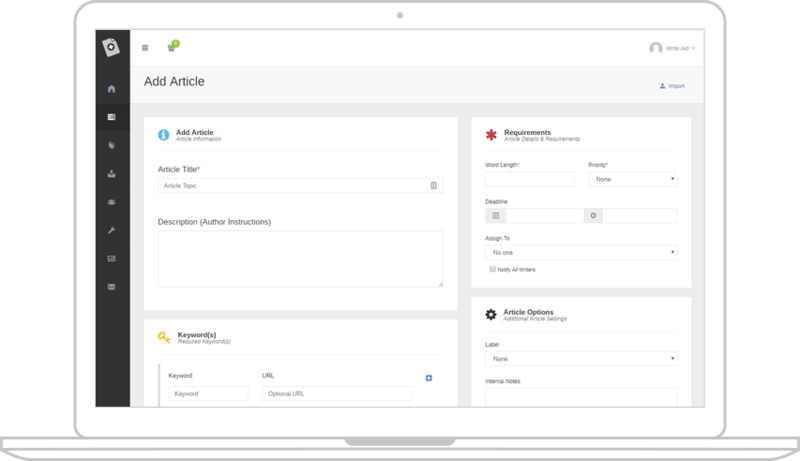 By using our article and writer management software system, you will be able to better manage your writers and article/content creation and publishing. Learn how to manage a team of writers effectively by using Write Aid. Outsourcing can definitely take its toll on you - by taking your money and giving you headaches in return. With a solid system in place you can get rid of all of your outsourcing hang-ups. Tired of having to micro-manage your writers? There's no need if you're using WriteAid - your writers will basically manage writing themselves! Managing content writers should help give you MORE free time - and unless you have an efficient system in place, you're still wasting your (and your writers) time unproductively. We've integrated our system with popular services to make your life even easier, such as WordPress and Copyscape. Add (or import) your content requests by including article details, author instructions, content requirements, and more. 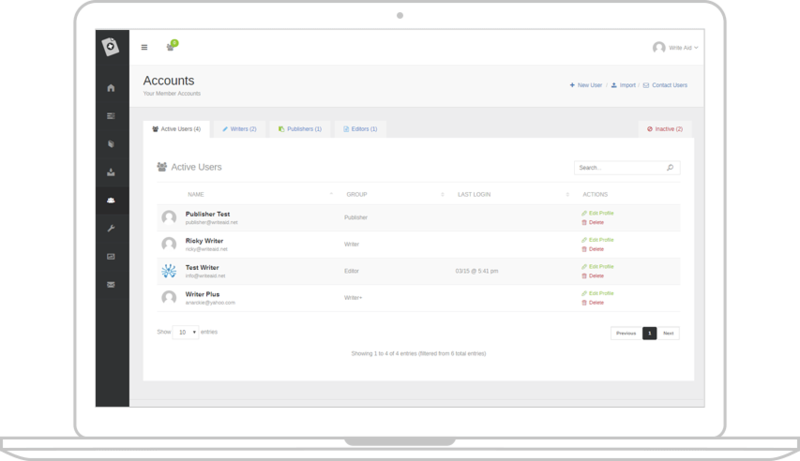 Create individual accounts for all your writers, editors, publishers, etc. Review all content submissions from your writers for easily publishing. Our package are designed for usage. Free, Personal, and Business levels are available. All new sign ups receive a 14-day risk free money back guarantee - no questions asked! “”I have been using WriteAid for about a year now and it is hard to imagine life without it. Before WriteAid, I was trying to foolishly manage a team of writers with Google Docs. WriteAid provides not only a better experience for me but also for my team of writers. I have saved hundreds of hours with WriteAid! “”There is no doubt that Write Aid has changed how I work. Before it, I had multiple writers emailing me with their work each day. While I tend to be organized there were times when it became so overwhelming that I wasn’t sure if I had posted something or not yet! With Write Aid there is no more confusion! “”I think I stay away from any program which costs me more money than I can afford, but this is one program that is worth it. I think every link building service should invest in this, or anyone with writers. I asked my writers what they thought and they said it's much better than the spreadsheets. If they are happy then I'm happy! Subscribe to receive system updates!